Honolulu officials say a dam where waters rose rapidly during a tropical storm is not in danger of failing. Board of Water Supply Chief Engineer Ernie Lau said Thursday the dam is “nowhere close” to breaching. But he says water in the reservoir rose 4 to 5 feet (nearly 1.5 meters) overnight during heavy rains from Tropical Storm Olivia. City officials are asking people near Nuuanu (Noo-OO-ah-noo) Dam No. 1 to be alert for the possibility they may have to evacuate. A spillway could be used to release water from the dam, but that would cause some flooding downstream. The water level is now is 18 inches (46 centimeters) below the spillway. Agency workers and firefighters are siphoning water from and pumping water out of the dam. 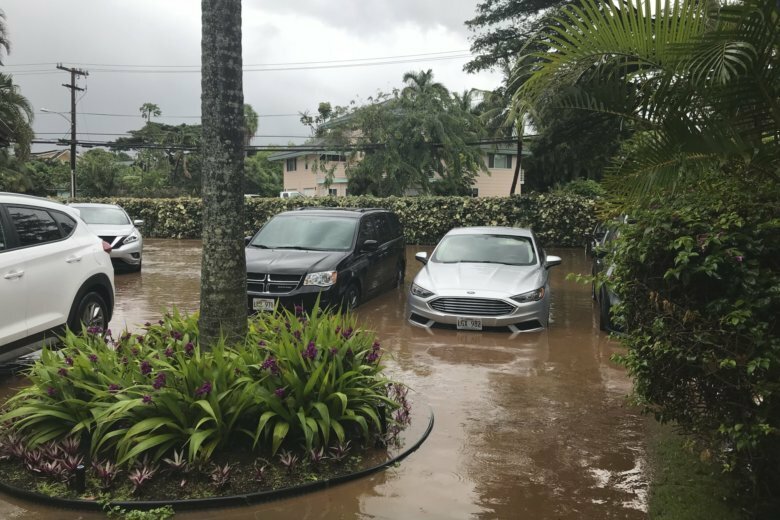 Honolulu officials are asking residents near a dam to stay alert for the possibility of evacuating as water levels in the reservoir rise amid heavy rains. City spokesman Andrew Pereira said Thursday it appears the rain is subsiding, but the city is taking a cautious approach and asking residents to remain alert. The city’s Board of Water Supply says 10,000 people may need to be evacuated near Nuuanu (Noo-OO-ah-noo) Dam No. 1. The agency says it’s siphoning and pumping water to keep it below the spillway. Tropical Storm Olivia dumped heavy rains Wednesday on Maui and Oahu as it crossed the state. Meteorologists say it’s now a tropical depression moving away from the islands, but moisture will linger. Olivia crossed the state Wednesday, dumping heavy rains on Maui and Oahu. Meteorologists say it’s now a tropical depression moving west away from the islands. The city’s Board of Water Supply said Thursday the water level in Nuuanu (Noo-OO-ah-noo) Dam No. 1 is about 18 inches (46 centimeters) below the spillway. The agency says it’s been siphoning excess water to keep the water below the spillway but Olivia’s rains outstripped its siphoning capacity. The city’s Department of Environmental Services said Thursday workers noticed the overflow at 10:40 p.m. the previous night. They stopped the discharged just before dawn. Heavy rain and winds from a tropical storm have downed trees, knocked out power and prompted evacuations of several homes on Hawaii’s Maui island but spared the state widespread damage before continuing out to sea.